We enjoyed everything about the cabin. It was comfortable, homey and clearly well loved. They were very helpful with reservations and when I had an issue. The property is great and would be nice when the weather is warmer with the lake right behind the place. 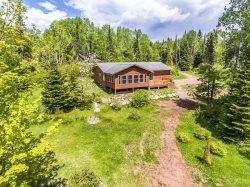 The location is a little out there but not too far from Grand Marais. The inside was spacious and cozy. Plenty of room for 7 people. The only thing I have a complaint about was the ice outside along the garage to where the front door. Since you weren't able to open the garage door, it was very dangerous to walk to get into the property. Also, the garage door cable was broken so you couldn't open it without pulling the cable up and down to close it. House and location was excellent. Check in was very easy. Hope to be back again soon! Super nice and knowledgeable. They helped book our last minute stay quick and efficiently and was able to find available rentals to look at. The house was more beautiful and spacious in person. Love the view of Lake Superior in the backyard which was only a few feet away from the home. All the amenities were well stocked and had everything we needed for the stay. We didnt need to bring anything extra except for our toothbrush. They supply soap but, I prefer to use my own. We had 4 adults and 6 kids during the trip and the kids enjoyed being there even with no WiFi. It was nice to see them interact with each other and not sit on their electronics all day like they do at home. They also provided many game boards, etc. as well as DVDs and books to keep us entertained. The gas grill was also a plus but, we didnt use it because it was a little chilly the day we arrived. We had a 2 nights stay at Pointavu and wanted to stay the entire weekend but, we had to leave a day early because something in the home triggered my 2 year old sons allergies.. we drove 6 hrs back home that evening and had to bring him to the ER to treat his wheezing/breathing. Cascade Vacation Rentals is the best! Wonderful house! Very spacious, modern, and clean. Having bedrooms spread out over three levels was great for our extended family as everyone had their own space. The house had everything we needed. Highlights of the weekend were watching an eagle we think has a nearby nest perched nearby and fly around fishing in the morning and then watching a ship on Lake Superior. Booking through your agent was adequate. I wouldnt say she was sunshiny, but she got it booked for me. Id you're on the north shore for skiing, hiking or relaxation, Base camp is a perfect location. Just a few minutes from Lutsen Mountain, Lockports amazing breakfast and a few steps from the lake. EXCELLENT customer service. Great follow through and very good phone voice. It's nice to speak to real people that sound happy instead of robots! So helpful, quick response time, and they were very professional. I felt very comfortable that I was working with a solid company and expectations for stay were well laid out. My only interaction was when I called to give our Credit Card #. Staff was friendly and helpful!! This house was amazing and met all our needs. The proximity to Lutsen Mountains, as well as hwy 61 was perfect. Great location on shore, with great sunrise views. Near Lutsen ski area and the beautiful Temperance River state park. Nice space with great common /dining areas and a great master suite. The location and views are spectacular! Great condo; very warm and cozy! Always a pleasure. We worked with Jaye getting our stay set up and Beth and Elizabeth on the phone right before and during the stay and they were able to answer our questions. We have always had great experiences with Cascade Vacation Rentals! We enjoyed Caribou Highlands 144C. It is a great location for easy access to the pool and hot tub, right down the stairs. The view was great on the deck facing Moose Mountain. Great spot for ski in and out. The condo was lovely and the views were spectacular. Great place to stay. We will be back next year! The unit was a little dated, but nevertheless, was very nice and quaint. We loved the wood burning stove, and the ability to ski in and out of our place. The loft area with the bunk beds was perfect for our family of 4 (2 adults, 2 young children).We will look to stay in the same unit next year. We enjoyed our stay at Caribou Highlands. It is so convenient for the activities we wanted to do. (downhill skiing at Lutsen, visiting Grand Marais, hiking in Tettegouche and Temperence River State Parks). We also discovered great cross country skiing by Tofte. We have stayed in these units before and we will again! The unit was clean and well stocked (only missing a couple of small things ). Communication is always an important aspect for us and your team did an awesome job with that. It was great to be given a few attractions nearby giving everyone of us more things to do during our stay. Responses were quick and directions were very easy to follow. Everything was wonderful! This was our second year staying at the house and it was amazing (as the year before)! The location was easy to get to and had just enough space between the neighboring houses to make our stay even more memorable and private. The view from the rooftop was amazing and the layout of the house, itself, made this the perfect size for us. It's very cozy and spacious. We had a very good experience working with Cascade Vacation Rentals. We enjoyed our time at Northern Lights Cottage very much. It was quite comfortable.